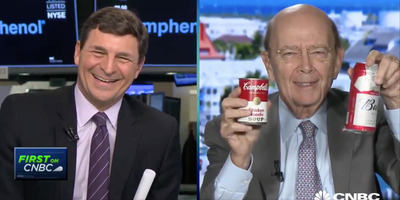 CNBCWilbur Ross holding up the cans. Commerce Secretary Wilbur Ross used cans, including a can of Campbell’s Chicken Noodle Soup, to explain that President Donald Trump’s new tariff on steel and aluminium is not too bad. Campbell’s Soup told Business Insider it does not support the new policy. “Any new broad based tariffs on imported tin plate steel – an insufficient amount of which is produced in the US – will result in higher prices on one of the safest and more affordable parts of the food supply,” a spokesperson said. Campbell’s Soup Company replied to the Trump administration’s new tariffs on steel and aluminium after Commerce Secretary Wilbur Ross used the company as an example of the new policy’s muted effects. A spokesperson for the company told Business Insider that the tariffs are misguided and will end up causing price increases for US consumers. “Any new broad based tariffs on imported tin plate steel – an insufficient amount of which is produced in the US – will result in higher prices on one of the safest and more affordable parts of the food supply,” the spokesperson, Thomas Hushen, said in an email. On Wednesday, President Donald Trump announced the US will soon impose a 25% tariff, or import tax, on steel and a 10% tariff on aluminium. During an appearance on CNBC, Commerce Secretary Wilbur Ross – who long supported new tariffs – held up a series of cans including a Campbell’s Soup can to illustrate what he considers the muted effects of the new policy. A slew of companies from beer brewers to automakers have warned that the new tariff could lead to higher costs and hurt their companies.